Human speech is a complex process. The lungs, vocal cords and sinuses all contribute to the tone, quality and volume of the voice., while the lips, tongue and other structures in the mouth control how we form words. Most people are not trained to speak; it just comes naturally. We learn from observing others. However, there are specific techniques that improve the quality and tone of the voice and allow us to speak loudly and clearly without vocal strain. Breathe from your diaphragm. The vocal cords are like the reeds in a clarinet, they vibrate as air passes over them--the stronger the flow of air, the louder the sound. Inhale and exhale, deeply, to increase the volume of air in your lungs. With diaphragmatic breathing, your stomach should expand and contract with each breath. Relax your neck and shoulders. Tension in the neck and shoulders hampers air flow and constricts the vocal space. The vocal cords need to vibrate together but, if the space is too constricted, it's like the dampening affect on a piano. To loosen your neck and shoulders, shrug your shoulders up and down and rotate your head in both directions. Maintain proper posture. Keep your shoulders neutral and your head centered. Your ears should be in line with your shoulders and your chin relaxed. Do not tuck your chin or jut your chin forward. Avoid slouching, and keep your spine neutral and your rib cage relaxed. Speak in your natural voice. 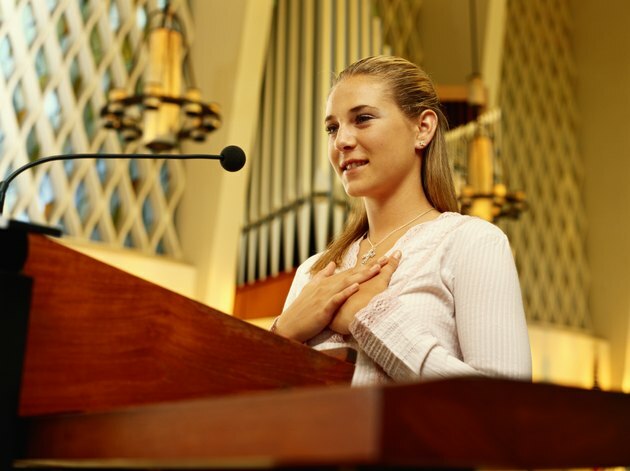 Speaking in a tone outside our natural voice can put strain on the vocal cords. To find your natural voice, inhale deeply, open your mouth wide and exhale while making a "Ha" sound. Avoid yelling. Yelling constricts the vocal cords and can actually cause damage. Practice this exercise to discern the between yelling and volume control. Inhale deeply. Open your mouth and exhale while making a "Ha" sound. Use your diaphragm to control the rate of air flow and observe how the sound gets louder and softer. This is volume control. Now, do the same exercise but try to affect the volume by tightening your vocal cords. Notice the tension in your neck and the strangled quality of the sound. That is yelling. Keep your throat moist by staying properly hydrated. Your sinuses are designed to warm and moisten the air before it hits your throat so inhale through your nose, instead of your mouth. If you have trouble breathing through your nose, consult your physician. A stuffy nose will also adversely affect vocal quality. Practice speaking quickly. Try singing or reciting "The Major General's Song" from "Pirates of Penzance" or recite a passage from a book as quickly as possible. Tongue twisters are another useful tool for enunciation. Practicing quick speech keeps the lips and tongue supple and prevents mumbling.